Puti (Head of Core Growth) - She passionate in big data, data mining, predictive modeling and quantitative research and she will spill the secret of what GO-JEK growth team do. 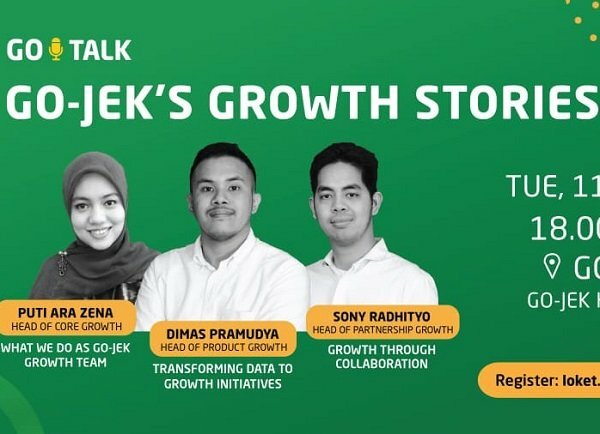 Dimas Pramudya Putra (Head of Product Growth) will tell you about how to transforming data to growth initiatives and how to enriching user experience toward GO-JEK product. Sony Radhityo (Head of Partnership Growth) is responsible to grow GO-JEK as a platform through strategic product partnerships by leveraging existing product infrastructure, that's why he's the right one to sharing about growth through collaboration. All the speakers are lining up, so make sure you book your seat because this session will spill another secret about what GO-JEK do.